Cookies and ice cream are probably the best pairing next to cheese and wine. My favorite store-bought cookie as a child were the Mother’s Circus Animal Cookie Parade. I’d dig through the bag and just eat the frosted- and sprinkle-clad, buttery shortbread cookies, discarding the rest. 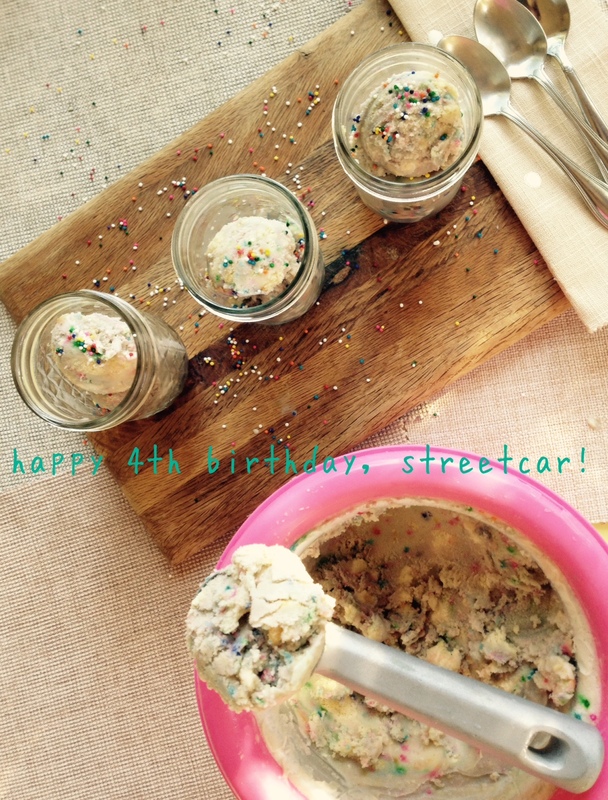 For A Streetcar Named Devour’s 4th Birthday (GASP! It’s already been 4 years?!) 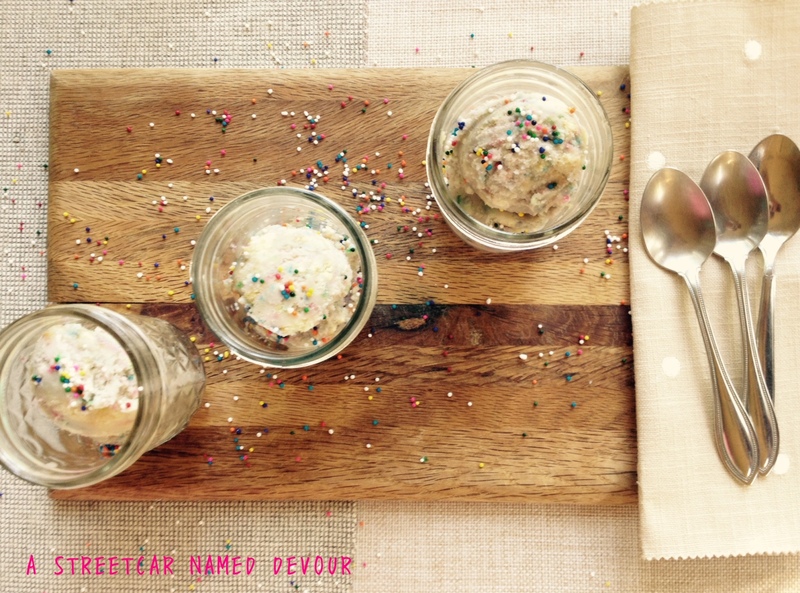 I wanted to create a spin on an old-school favorite and make an ice cream that tasted like those pretty pink-and-white cookies. 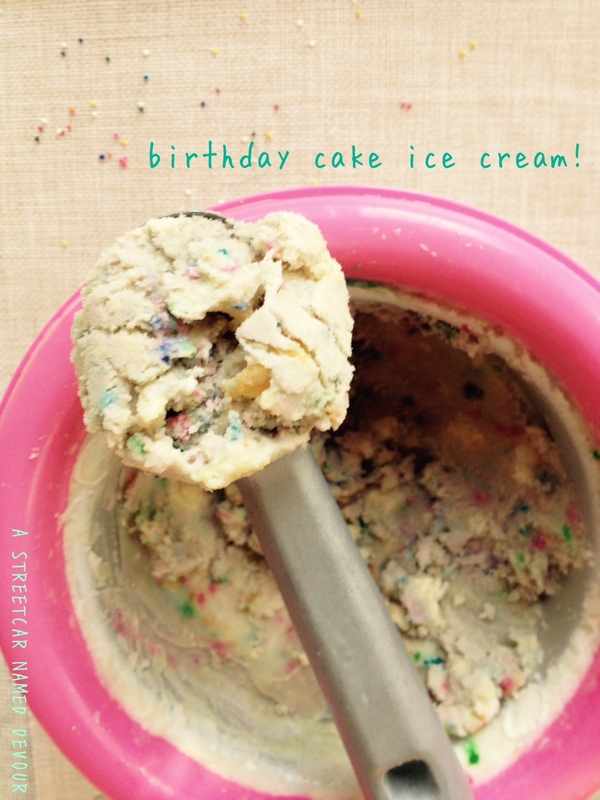 This recipe includes real frosted vanilla cake bites (leftover birthday cake cut into bite-sized pieces) with a great vanilla ice cream base recipe from David Lebovitz’ must-have book, The Perfect Scoop, and, of course, sprinkles. And lots of ‘em. Heat the milk, salt, and sugar into a saucepan. Scrape the seeds from the vanilla bean into the milk with a paring knife, then add the bean pod to the milk. Cover, remove from heat, and infuse for about 1 hour. To make the ice cream, set up an ice bath by placing a 2-quart bowl in a larger bowl partially filled with ice and water. 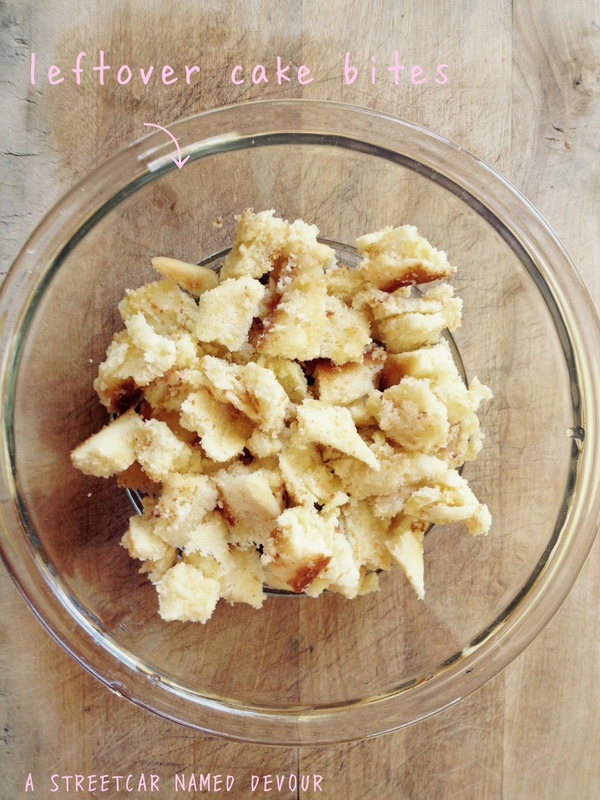 Set a strainer over the top of the smaller bowl and pour the cream into the bowl. Strain the custard into the heavy cream. 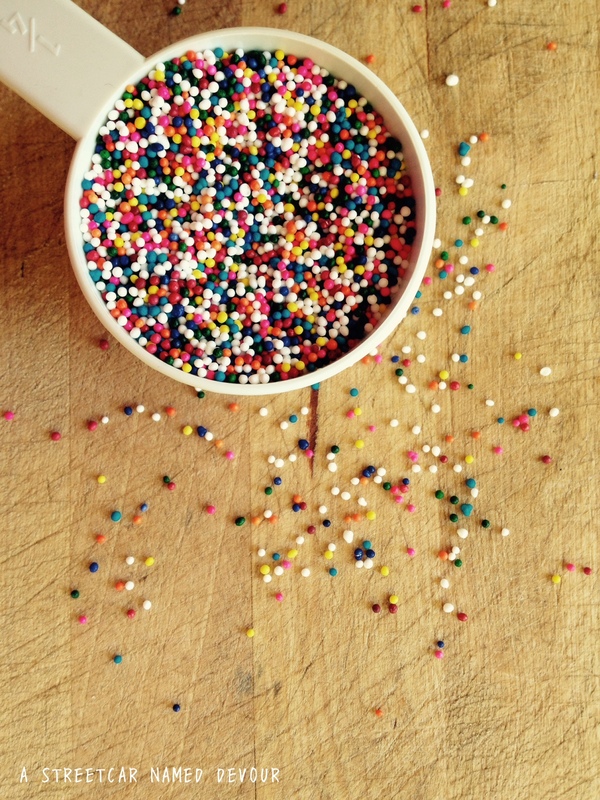 Stir over the ice until cool, add the vanilla extract, frozen cake bites, and sprinkles. Refrigerate overnight to chill thoroughly. **Cook’s note: It’s important to freeze your cake pieces beforehand, so that the pieces don’t soften once incorporated into the ice cream base. I like to first freeze the cake slices (and securely wrap them in plastic wrap) for about 3 hours, then cut them into the bite-size pieces, then return them to the freezer (again wrapped in plastic) before adding to the ice cream.